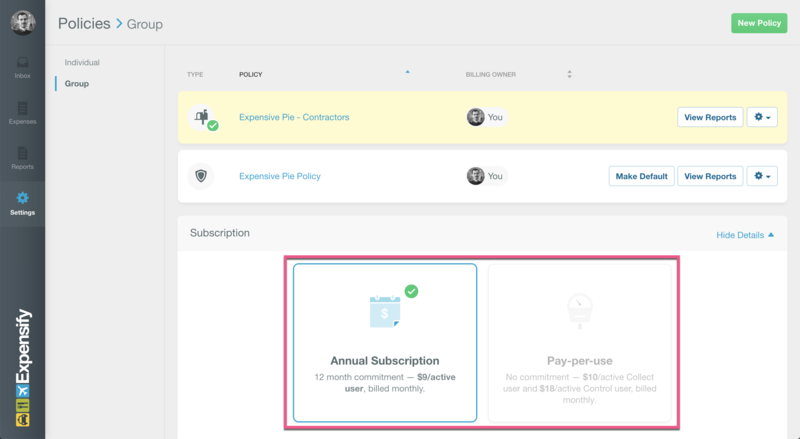 When you first create an account, we automatically put you on a free trial of an Individual Monthly Subscription so that you can experience all of Expensify's features. At any time, you can always switch to the free version of Expensify. If you decide to continue with Expensify's paid features, your monthly bill ultimately depends on your plan, policy type and your selected billing option. Your Expensify policy is where you create expense rules, define approval workflows, manage integrations, configure reimbursements, and more. There are two Plans on the Individual Policy; Submit and Track. Both are configured within the single Personal Policy available in the Individual tab. You can always tell whether your Individual policy is configured for Submit or Track based on the Paper Plane icon (Submit) or the Piggy Bank icon (Track). You can always change the Individual Policy Type from the Settings > Policies > [Individual Policy Name] > Plan options. Unlike the Individual tab, within the Group policies tab, you can have multiple policies based on their Plan. Either Collect or Control. You can always tell whether your Group policy is configured for Collect or Control based on the Mailbox icon (Collect) or the Shield icon (Control). All subscriptions are managed from the Settings > Policies > Group page under the Subscriptions dropdown. Remember, the subscription is relevant to policies for which you are the Policy Billing Owner! You can always change the Group Policy Type from the Settings > Policies > [Group Policy Name] > Plan options. Choosing the policy that’s right for you will depend on your teams’ needs. Go ahead and check out our features breakdown if you’re not sure which policy is right for you. We offer two billing options -- Annual Subscription and Pay-per-use Billing. 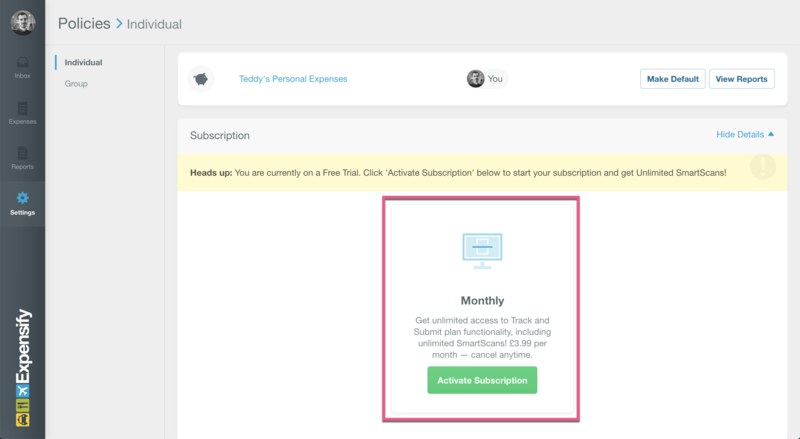 Both options are billed monthly and use the concept of an “active user”. We define any report action as activity. So within a given month, if a user's account has taken actions on a report, they’re considered an active user. For example, editing, submitting, rejecting, deleting, approving, commenting on, exporting or reimbursing a report will all count towards activity for the month. Note: Report actions include those taken by delegated actors such as a Copilot or Concierge automation. If needed, you can create multiple policies without any additional cost. You'll still be charged based on the number of active users across your policies. Billing owners of exclusively Control policies (or a mix of both Collect and Control policies) are charged $9 per active user on an annual subscription. Any additional users over the set subscription size will be prompt an $18 charge for actions taken on a Control policy and a $10 charge for actions taken only on a Collect policy. Otherwise, billing owners of exclusively Collect policies are charged $5 per active user on an annual subscription, with additional activity charged at $10. Expensify is free if you don't need a Group policy to track your expenses. If you want to access additional functionality, upgrade to a Group paid account.